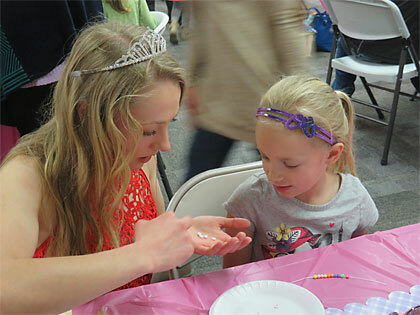 Tea parties, dresses and tiara's are items that little girls dream of. 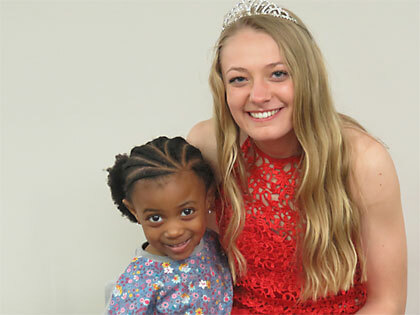 Geneva Rotary Club member, Angie Hafer made 67 girls (and a few boys) dreams come true by putting together a "Dolly and Me" tea party on March 18. Girls and boys from Fillmore, Thayer and Clay counties attended the event at the Geneva Public Library. Pink and purple plastic (non spillable) cups, pink and purple table runners and tiny little desserts made by Jill's Sweet Shop in Geneva were waiting for these girls and boys. Fillmore Central Homecoming Queen Jamey Broman arrived in her ball gown and tiara ready to be the guest of honor. A line a mile long filled with excited girls and boys waited to meet and have pictures taken with the queen. The afternoon was filled with giggles, beads and visiting with friends. Most of the kids brought a special friend from home, such as monkeys, bears and unicorns...but the dolls...a plethora of dolls...barbie dolls, baby dolls, my life dolls. The girls and boys not only listened to Princess Jamey read stories, they also made bracelets for themselves and their special friends. Bruning State Bank made a donation for supplies needed for the tea party; Heartland Bank donated Samantha, an American Girl doll; and Myla Rose Boutique in Geneva donated a gift certificate to their store. Both were raffled off during the afternoon to two lucky little girls. Rileigh Carlson was the lucky winner of the gift certificate to Myla Rosa Boutique and Dalia Torres was the lucky winner of the American Girl doll. Each child took home the bracelets they made, their drink cup and a book given to them from the Geneva Rotary Club. Angie Hafer of Geneva, also a member of the Rotary Club came up with the idea of a tea party. "We were looking for fund-raiser ideas to support the different activities we have going on," she said. "I had seen somewhere someone was doing the Dolly and Me tea party and thought how unique is that. You don't see that very often. You always see the daddy-daughter dances, but you don't see anything like this." The Geneva Rotary Club does one to two scholarships per year for high school seniors, they are the Boy Scout charter and sponsor an annual Geneva coat drive. The Geneva Rotary Club stopped doing Literacy in a Bag, and this was mainly why Hafer wanted to find another fund-raiser. The Geneva Rotary Club is hoping to get nursery rhyme books to give to all over tyke and head start students, which is Hafer's goal.